A wonderful good morning text greeted me this morning and I knew I have to make a trip to McDonald's today, no matter what. 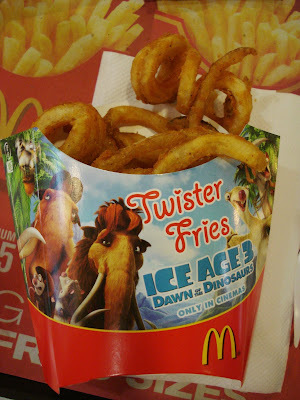 How I wish this can be part of the core line-up but then again, this is what makes the Twister Fries so special. The fact that we have to patiently wait for it to be available once a year and we make sure to indulge and enjoy this to our heart's content before it disappears again. HOLY MOLY! They're back!!! Do you know how long they have it for?? I just watched Ice Age 3 the movie last night with neighbors. Waaay better than Transformers 2.